Women account for 48.5 percent of the general population of India, but only constitute about 31 percent of the total work force in the country. You may think that this corresponds with what you know about the status of women in India. But a deeper look at the trends would shock you. First, as our economy grows, fewer women are joining the workforce. In fact, women’s workforce participation fell by almost 12 percentage points in six years (from 37 percent in 2004-05 to 25.5 percent in 2010-11). The International Labor Organization (ILO) placed India as low as 120th of the 131 countries it ranked on women’s workforce participation rate. Second, urban women are less able to join the workforce than their rural counterparts. Women’s work force participation in India is lower in urban areas (15.44 percent) than in rural areas (30.02 percent). How can this be true when cities today are the source of jobs, income and prosperity? The lack of women’s participation comes at an enormous cost. According to United Nations Economic and Social Commission for Asia, if the employment rate of women in India were to be at par with that in US (i.e. 86 percent), that alone would increase the GDP of the country by 4.2 percent, which translates to a whopping $19 billion. Even a 10 percent increase in women’s participation would mean a $5 billion/ year gain. Why Are Women Missing from the Labor Force? There are multiple factors which together account for the missing women in India’s workforce. Recent studies have shown a correlation between violence against women and women’s work force participation. A survey of non-working women in Delhi showed that ‘lack of safety’ was one of the biggest reasons for their decision to not enter the formal workforce. Another report by Chakraborty et al in 2014 stated that women are less likely to participate in the labor force when the perceived threat of crime against them is high, and this deterrent effect is likely to be stronger in traditional societies. Women tend to avoid places/ locations which are known to be unsafe or which they perceive to be unsafe. That is, the presence of threat or even the perception of threat leads a woman to self-restrict her movement. Freedom of movement is one of the biggest casualties of violence against women in public spaces. Women are known to be more dependent on the public transport system, given the unequal access to private transport. 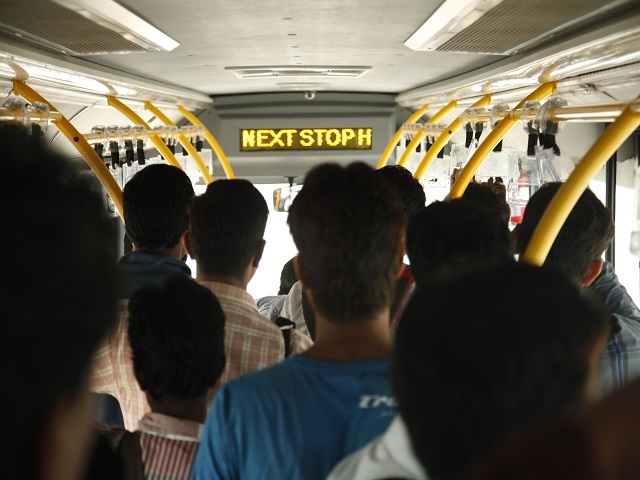 However, when harassment happens in the public transport system, the impact is not restricted to their use of public transport facilities alone. The impact is amplified because it directly affects their access to economic, social and health opportunities given the role of transport in providing access. That is, when women stop using public transport due to a lack of safety, it severely impacts their mobility and thus access to opportunities. Also, considering that women have traditionally played the role of the primary caretaker of children and elderly at home, the lack of freedom of movement for women could impact entire families and thus cause heavier economic impacts. Today, public spaces and public transport in cities are simply not safe enough – read well lit, easily accessible and low threat of crime – for women to use at any time of the day. A city which ensures freedom of movement for women, through safety in public spaces and public transport, will reap not only social benefits but deep economic benefits as well. A dingy bus stop, or a series of them, can thus cost more than a few dollars to the country.